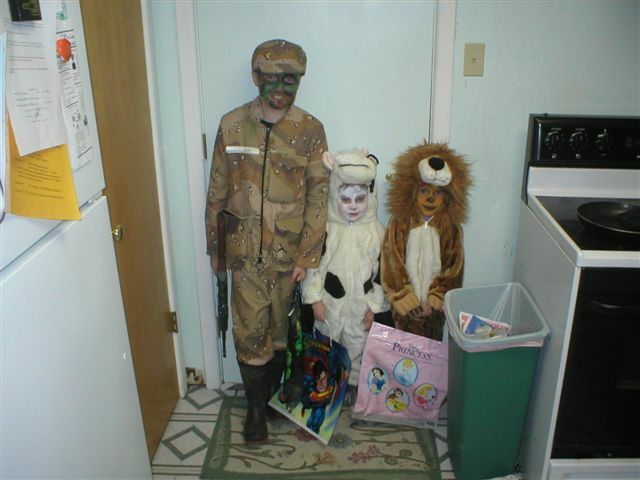 Jason went as a Special Ops soldier, Heather as a Lion, and Sean as a cow. They were all really cute and had a blast doing pumkins and trick or treating. I didnt carve a pumkin this year, Heather, Sean, and Elaine did one and Jason did one. Jason's is the spider and the face is the other kids. Jason really did a good job on his and yes, he did do it all by his self. The kids were really excited about going trick or treating this year, I had to jog to stay up with them. They would just run full blast from one house to the next. Heather would yell "Trick or Treat!!!" as they opened up the door, Sean would simply say "I want Lots of them!" and hold his bag open and wait for a second handfull. I think he may have ended up with the most candy. We made about 4 blocks and the kids were just draggin their bags they were so heavy and wanted to go home for a change. It is turning a little colder up here, had to throw on long sleeve shirt for the first time in months. Everything else seems to be going ok here in Lubbock, nothing new just kids growing up too fast and us getting old.